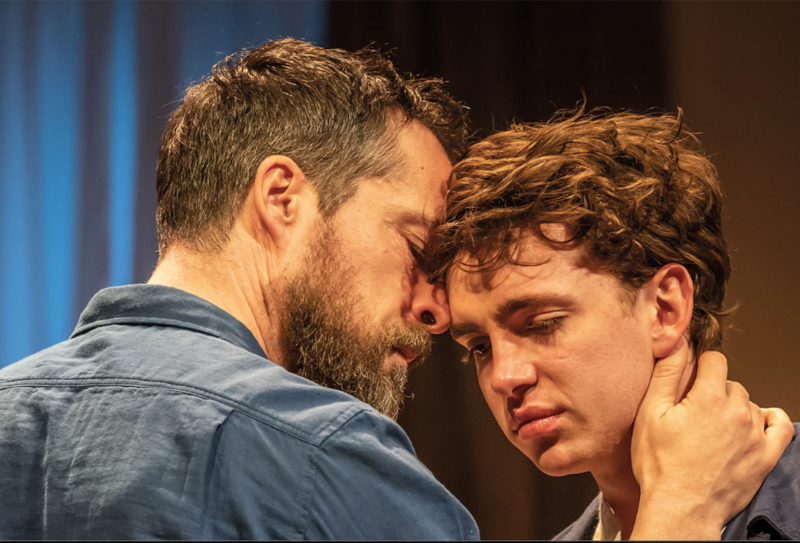 Rory O'Connor watches The Son at the Kiln Theatre in London. I left the Kiln Theatre emotionally drained; The Son is immersive, uncompromising, raw and visceral. I am still reflecting on it. The audience is taken on an emotional tsunami of teenage depression, self-harm and suicidality. It focuses on one family’s attempt to deal with the unravelling of their son, Nicolas (Laurie Kynaston), against the backdrop of divorce and new family relationships. We first see Nicolas before the play ‘begins’, pacing the stage furiously and scribbling on the walls as the audience are taking their seats. Pain etched on his face. We then meet Anne (the mother, Amanda Abbington), Pierre (her work-focused ex-husband, John Light) and Sofia (his new partner, Amaka Okafor) and their baby. Nicolas hasn’t been to school for three months, Anne is struggling; she’s at a loss and thinks he would be better off living with his father, Sofia and his little half-brother. Sadly, this solution doesn’t have the desired effect and over the next 1 hour and 45 minutes, we track Nicolas’ angst, his hoped for recovery, his relationship with Sofia and his mother’s forlorn efforts to keep hold of her cherished son. Alongside exploring the relationships among the family, old and new, there are brief moments of light; when egged on by Sofia, Nicolas mocks Pierre’s dad-dancing with his father responding by throwing amusingly impressive shapes. This juxtaposition serves only to illuminate their struggle more profoundly; providing a glimpse of happier times. You really feel each family member’s angst and pain; right down to the pit of the stomach. It took my breath away in parts. Incredible performances all round: Amanda Abbington and John Light are brilliant, you get a sense of what bound them together in marriage, their helplessness to keep their son safe and Abbington’s thwarted desire to have her family back together. Both are utterly captivating. Laurie Kynaston’s take on Nicolas is equally powerful. It is vulnerable and nuanced, conveying the nothingness as well as overwhelmingness of depression and suicidal pain. Amaka Okafor’s Sofia is excellent also, as the new partner who is struggling to connect with Nicolas and understand his emotional pain. The staging is exquisite; the clean, sharp lines and white walls of the Parisian apartment help to illuminate the emotional turmoil of this teenage life which is metaphorically strewn across the stage. - The Son is showing in The Kiln until 6 April 2019. It is part of a trilogy from French playwright Florian Zeller: see also our review of The Father. - Reviewed by Professor Rory O'Connor, Director, Suicidal Behaviour Research Lab, University of Glasgow. If you are affected by suicide or you are worried about someone, Samaritans is available 24/7 on 116 123 or via email [email protected]. More crisis information is available here. Find more on suicide in our archive.